We’re all experts at something; whether it’s managed IT services or changing the brakes on a car. You perform your best, based on your knowledge and experience of that particular type of work. You may not know it, but you rely on information technology to run your business each and every day. However, is information technology your core expertise? How experienced are you or your other employees at managing your business technology needs? Do you outsource specific projects or job tasks at your company, such as a marketing agency or a project management team? Have you ever thought about outsourcing managed IT services? Before you can decide if you need to (or want to) outsource your IT needs, you first need to understand what managed IT services are and how these services can support specific tasks, job functions, and business goals. Well, here’s a little history and background of managed IT services. In the past, the companies who’ve helped service small businesses have experienced challenges doing so by the lack of tools to help with technical problems. Maintenance of business technology systems and equipment early on was break-fix only. A break-fix model means that when something breaks, the company would then call their IT support provider to (hopefully) fix the problem. Unfortunately, there’s nothing proactive about this model. A break/fix model is a very reactive approach and doesn’t necessarily allow for routine or preventative system maintenance. However, as technology advanced and the need for managed IT services became more popular, IT services providers began to periodically perform on-site visits to do a systematic review of logs and user information, looking for hints of issues before they turned into larger problems. The problem with this was that these managed IT professionals could only see what was happening on that particular day or time. If an issue occurred at another time when the system wasn’t being monitored, the problem would go unresolved. Business always tends to expect more from providers, so the natural progression of these types of services became clear. IT service providers had to learn to do more and become more proactive in order to compete. The demand for managed IT services is pretty high nowadays, especially with all of the new technology and apps our businesses, customers, and employees use and need every day. In a nutshell, managed IT services is a way to outsource the day-to-day management of your information technology needs. The specifics vary on the services provided by managed IT services providers. Some service providers offer an “a la carte” choice of services. Others offer a complete, interlocking suite of core services. For example, some companies offer network monitoring and alerts only (your internal IT must fix the issues) and additional services for complete monitoring and problem resolution. Other companies, however, can monitor, alert, and resolve your issue as an all-in-one service. The type of pricing model you choose is entirely up to you, and the needs of your business and your employees. 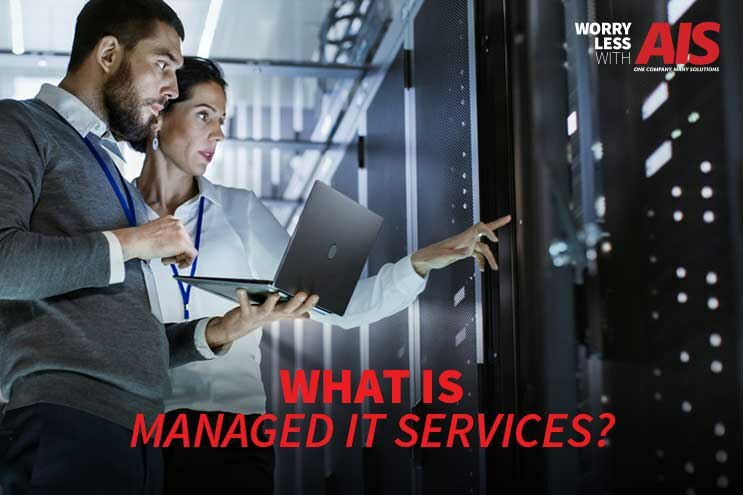 As you search for help managing your IT needs, you’ll probably see the terms, “managed service provider (MSP),” “managed IT service provider” and/or “managed network service provider” appear in your search. Regardless of the particular phrase, any of these companies are companies that can manage your IT infrastructures, such as servers, backups, networks, document management, computers, and telephones for a flat fee via a subscription model. A subscription model is a pretty big move from an IT break-fix model. This model allows proactive management of your IT, making it easier to budget, plan for the future, refocus internal resources, and prevent IT issues from occurring. Mostly, an MSP can be your IT department or supplement your IT department for a vCIO (virtual CIO). A Chief Information Officer, also known as a Chief Digital Information Officer, is responsible for the strategic insight on how technology drives your business forward. They are the bridge between the technology and business sides of an organization and link the two together to meet the overall objectives and goals. A vCIO manages IT resources and budgets, makes recommendations on the purchasing of equipment, manages IT resources, plans and develops policies, evaluates security, and calculates how to make additional profits using the business's technology. They are responsible for the company’s technology roadmap and ensures the company is staying up to date on system updates and upgrades. A vCIO can be an attractive offering to any growing business that can’t afford a full-time CIO and only needs one part-time to oversee their IT strategy. Learn more on the importance of a vCIO and the benefits of using one by reading our article, What's a Virtual CIO (vCIO) — How Can it Benefit Your Business? Doesn’t it sometimes feel like there’s always something wrong with the technology at your office? When your IT systems are performing well, it almost seems like it’s like magic. The ability to video chat with someone around the globe is fantastic. Even though it’s second nature to us now, the ability to email is still a huge leap in communication capability. Network overhead (staffing, infrastructure) is expensive, and services need to increase as your business grows continually. You might want to read a recently published article from CIO that dives deeper into some of these IT challenges that businesses face, The 12 biggest issues IT faces today. Keep in mind that a great managed IT services provider is really your business partner. Just like any other partnership, you want a managed IT services company who helps you identify how IT can be used to achieve your company’s overall business goals. Look for a partner who cares just as much about your success, as they do about their own. Proactive support – Continual monitoring enables a managed IT company to fix small issues before they blossom into huge ones, as well as provide regular maintenance of software and hardware. Data security – Nip any security issues in the bud, before they’re ever able to affect your company files and data, by using a secure firewall, servers, malware, and anti-virus protection. Data backup – Daily (even hourly when required) backup to multiple locations is a huge piece of disaster recovery strategy that you’ll be glad your business has in place, for those unexpected events that could hit your business. Vendor management – You, your employees, and your customers will all get peace of mind when you can monitor your contracts; ensuring all deliverables are met. Onsite support – 97.5% of technology issues are fixed remotely, and the downtime of your company can significantly decrease by having a monitoring system in place, to address the issues before you’re even made aware of them. Virtual CIO (vCIO) – Planning for the future and continual monitoring ensures your company can take advantage of current IT best practices and how to reach your individualized business goals. Ask yourself this – are your technology needs being met? Is your in-house IT department (or IT guy) spending too much time troubleshooting network connectivity, patching and updating virus protection, struggling to include security for mobile devices like smartphones? Are you paying monthly for unexpected IT break-fix services and blowing an unexpected hole in your budget? Do you feel confident that you have a plan to grow your IT infrastructure as your business grows? If you are a control freak this may not be for you. Giving up control to a third-party of the heartbeat of your organization (your IT) may make you a little squeamish, but the benefits can provide you that much-needed heartburn relief. If your answers to any of these questions left you slightly uneasy, a network assessment can start the process of seeing if managed IT services is a good fit for your needs. AIS is a technology company devoted to keeping up with the latest and greatest technology products and trends to better assist our current, prospective, and future customers. We’re not just a business technology solutions company, we’re your technology partner and strive to provide you with new and helpful data to further the success of your company and your individualized business goals. If you’re interested in expanding your knowledge, reach out to one of our business technology consultants, here. We’re here to provide you with peace of mind to help you win more business.